Hyperinflation is when the prices of goods and services rise more than 50 percent a month. At that rate, a loaf of bread could cost one amount in the morning and a higher one in the afternoon. The severity of cost increases distinguishes it from the other types of inflation. The next worst, galloping inflation, only sends prices up 10 percent or more a year. Hyperinflation starts when a country's government begins printing money to pay for its spending. As it increases the money supply, prices rise as in regular inflation. An increase in the money supply is one of the two causes of inflation. The other is demand-pull inflation. It occurs when a surge in demand outstrips supply, sending prices higher. But, instead of tightening the money supply to stop inflation, the government keeps printing more. With too much currency sloshing around, prices skyrocket. Once consumers realize what is happening, they expect continued inflation. They buy more now to avoid paying a higher price later. That excessive demand aggravates inflation. It's even worse if they stockpile goods and create shortages. To keep from paying more tomorrow, people begin hoarding. That stockpiling creates shortages. It starts with durable goods, such as automobiles and washing machines. If hyperinflation continues, people hoard perishable goods, like bread and milk. These daily supplies become scarce, and the economy falls apart. People lose their life savings as cash becomes worthless. For that reason, the elderly are the most vulnerable to hyperinflation. Soon, banks and lenders go bankrupt since their loans lose value. They run out of cash as people stop making deposits. Hyperinflation sends the value of the currency plummeting in foreign exchange markets. The nation's importers go out of business as the cost of foreign goods skyrockets. Unemployment rises as companies fold. Then government tax revenues fall, and it has trouble providing basic services. The government prints more money to pay its bills, worsening the hyperinflation. There are two winners in hyperinflation. First, are those who took out loans. They find that higher prices make their debt worthless by comparison until it is virtually wiped out. Exporters are also winners. The falling value of the local currency makes exports cheaper compared to foreign competitors. Exporters receive hard foreign currency, which increases in value as the local currency falls. 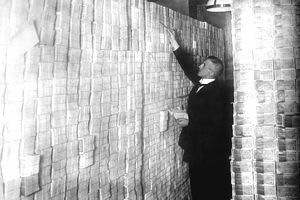 The most well-known example of hyperinflation was during the Weimar Republic in Germany in the 1920s. First, the German government printed money to pay for World War I. From 1913 to the end of the war, the number of Deutschmarks in circulation went from 13 billion to 60 billion. The government also printed government bonds. It has the same effect as printing cash. Germany's sovereign debt went from 5 billion to 156 billion marks. At first, this fiscal stimulus lowered the cost of exports and increased economic growth. When the war ended, the Allies saddled Germany with another 132 billion marks in war reparations. Production collapsed, leading to a shortage of goods, especially food. Because there was excess cash in circulation, and few goods, the price of everyday items doubled every 3.7 days. The inflation rate was 20.9 percent per day. Farmers and others who produced goods did well, but most people either lived in abject poverty or left the country. The most recent example of hyperinflation is in Venezuela. Prices rose 41 percent in 2013, 63 percent in 2014, 121 percent in 2015, 481 percent in 2016, 1,642 percent in 2017, 2,880 percent in 2018, and (a projected) 3,497 percent in 2019. In 2017, the government increased the money supply by 14 percent. It is promoting a new cryptocurrency, the "petro," because the bolivar lost nearly all its value against the U.S. dollar. It can't afford the cost of printing new paper currency. The International Monetary Fund projected prices to rise 13,000 percent in 2018. In response, people began using eggs as currency. A carton of eggs was worth 250,000 bolivars compared to 6,740 bolivars in January 2017. Unemployment rose to 21 percent, similar to the U.S. rate during the Great Depression. How did Venezuela create such a mess? Former President Hugo Chávez had instituted price controls for food and medicine. But mandated prices were so low it forced domestic companies out of business. In response, the government paid for imports. In 2014, oil prices plummeted. it eroded revenues to the government-owned oil companies. When the government ran out of cash, it started printing more. Rather than change its dangerous price and wage controls, President Nicolás Maduro is continuing unsustainable policies. Zimbabwe had hyperinflation between 2004 and 2009. The government printed money to pay for the war in the Congo. Also, droughts and farm confiscation restricted the supply of food and other locally produced goods. As a result, hyperinflation was worse than in Germany. The inflation rate was 98 percent a day, and prices doubled every 24 hours. It finally ended when the country changed its currency to the U.S. dollar. The only time the United States suffered hyperinflation was during the Civil War. The Confederate Government printed money to pay for the war. If hyperinflation were to reoccur in America, the Consumer Price Index would measure it. If you check out the current inflation rate, you will see that it is nowhere near hyperinflation--it isn't even in the double digits. In fact, inflation is too low. Mild inflation is good for economic growth. The Federal Reserve prevents hyperinflation in America with monetary policy. The Fed's primary job is to control inflation while avoiding recession. It does this by tightening or relaxing the money supply, which is the amount of money allowed into the market. Tightening the money supply reduces the risk of inflation while loosening it increases the risk of inflation. The Fed has an inflation target of 2 percent per year. That's the core inflation rate, which leaves out volatile oil prices and gas prices. They move up and down rapidly depending on commodities trading. That affects the price of food that trucks transport long distances. For this reason, the CPI also removes food prices from the core inflation rate. If the core inflation rate exceeds 2 percent, the Fed will raise the fed funds rate. It will use its other monetary policy tools to tighten the money supply and lower prices again. Some experts say that the Fed's interventions to lessen the recession will cause hyperinflation. The Fed's actions to expand the money supply won't cause hyperinflation. Most of the funds the Fed pumped into the banking system sit in bank reserves. It has not gone into circulation. If the banks start to lend too much, the Fed can quickly raise its reserve requirement and lower the money supply. Despite the rarity of hyperinflation, many people are still worried about it. So, if it were to happen, what should you do? There are three ways you can protect yourself from any kind of inflation. Sound financial habits would help you survive hyperinflation. First, be prepared by having your assets well-diversified. You should balance your assets among U.S. stock and bonds, international stocks and bonds, gold and other hard assets, and real estate. Second, keep your passport current. You'll need it if hyperinflation in your country makes your standard of living intolerable. Third, ensure that you have a wide variety of skills and talents. Hyperinflation makes a bartering system necessary when money is useless. A broad range of practical skills gives you an advantage when trading. If you need a wheelbarrow full of cash to buy a loaf of bread, you should know how to bake bread.